Carolinas Centers For Sight, P.C. 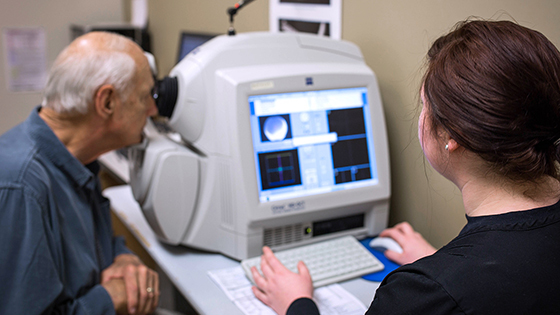 - Can An Eye Exam Predict Alzheimers? For many years, the tests to predict if someone will develop Alzheimer’s have been very invasive and expensive. Called PET scans, they explore parts of the brain where disease-specific plaques reside and can often determine if someone is on the path to developing the condition. However, a recent study at the Washington University of Medicine in St. Louis has uncovered an innovativeway to screen individuals for Alzheimer’s that will potentially change the way we prevent, diagnose, and treat the condition. A test group of 30 individuals who averaged in their 70’s wasexamined using traditional eye exam techniques with the addition of one element - by using angiography, medical professionals could identify how blood flowed through the vessels within the eyes. Coupled with the ability to view retinal thickness, researchers saw a clear link. They predicted which of the patients would be more at risk for developing Alzheimer’sbased upon noticeable retinal thinning and the absence of blood vessels in centralized parts of the retina and then compared this to the PET scans previously taken. All 17 individuals whose scans showed the development of the disease also had clear indications during their eye exam. While the progression of this disease can be slow, medical professionals have known that PET scans allow for early detection up to 20 years before symptoms begin. In general, Alzheimer’s includes the degradation of one’s memory as certain brain cells and connections end up dying as the disease advances. In general, the condition affects those who are aged 60 and above, although it can affect younger adults as well. Alzheimer’s is irreversible once it has started, and primary care physicians are quick to point out that simple lifestyle choices can play a huge part in prevention. Exercise, adequate sleep, and even eating a Mediterranean diet can all be beneficial when coupled with keeping one’s brain active. Crossword puzzles, card games, and making an effort to learn new things always top the list of activities in senior living centers, as Alzheimer’s prevention is an important concern. Researchers acknowledge that testing is still far from perfect, but if adults in their 40’s and 50’s were to engage in regular screening, it could completely change the way the disease is treated and managed. Depending on the age of the individual and the stage of their condition, Alzheimer’s may be addressed through physical or mental exercises while others may turn to medication or occupational therapy. Imagine if you knew that you had the very early stages of Alzheimer’s and wouldn’t start to fully experience memory loss until 20 years from now - would you change your lifestyle? Researchers are betting yes, and even have the hope of eventually testing certain pharmaceuticals to see if they will help to halt the progression of Alzheimer’s. As further studies continue to shine light on this devastating disease, there’s more and more hope that future generations will have the tools to screen for and prevent a wide range of issues before they manifest. If you haven’t visited your eye care provider recently, schedule an appointment today with Carolinas Centers for Sight, P.C. to ensure that you maintain optimal eye health and well-being.